Wayne Madsen, who smashed his second double ton for Derbyshire. (PHOTO BY: David Rogers/Getty Images). 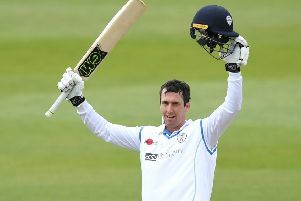 Batsman Wayne Madsen expressed his joy after saving Derbyshire’s second Specsavers County Championship, Division Two match of the season with a superb double century. Records tumbled as the 35-year-old South African finished unbeaten on 204 on the final day of the match against Gloucestershire at Bristol, which ended in a draw. Madsen said: “I was delighted to score my second double ton for Derbyshire. It meant a lot to me. “But my main focus was on helping the team continuing a good start in the County Championship because promotion is very much a target this year. Madsen and Alex Hughes certainly did that because they shared an unbroken stand of 278, which was a record for the fourth wicket for Derbyshire against Gloucestershire. Hughes contributed 109no. Madsen’s knock made him only the ninth Derbyshire player to pass 15,000 runs in all competitions for the county, and the first since John Morris in 1991. He also reached 10,000 first-class runs for the club.